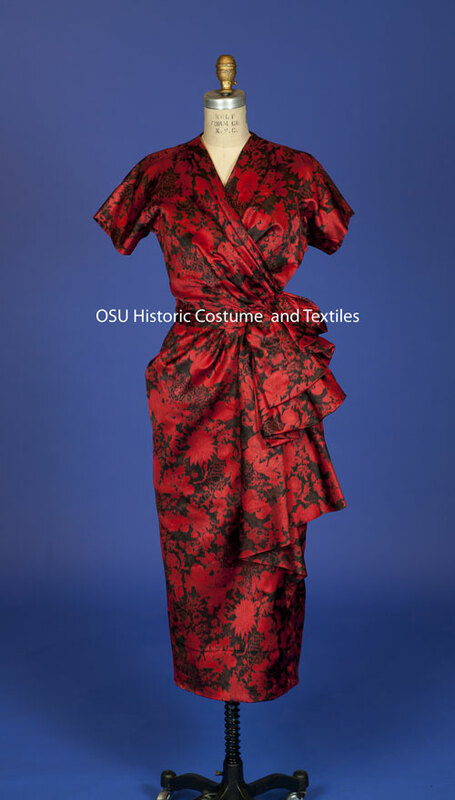 With the recent passing of Shirley Temple Black, we thought we would highlight three dresses from the collection that were produced under her name in the 1930s. Temple was five years old when she made her feature film debut and Daniel Thomas Cook points out that her wardrobe was designed with a “toddler look” and her retail line of dresses maintained a toddler line throughout the 1930s even when Temple was no longer a toddler herself. The production of trademarked Shirley Temple dresses was undertaken by the Nannette Manufacturing Company of New York City, for dresses in the toddler range, until the early 1940s. Additionally, the Rosenau Bros, Manufacturing Company offered Shirley Temple designs in Big and Little Sister styles in sizes 3-6 ½ and 7-12 years. Movie studios were well aware of the impact of their child star’s on-screen appearance and often hired well known designers to create their wardrobes. They often designed on-screen ensembles with an eye towards the apparel market. The Shirley Temple Cinderella Frock line was the most successful of all the Shirley Temple Brand fashions. Other lines included; socks, shoes, underwear, raincoats, jewelry, scarves, gloves and others. Temple’s mother insisted that Shirley try on all designs produced under her name as a means of quality control. Three or four poses were photographed wearing each scarf, swimsuit, dress, etc. One of the shots would then be used on a hang tag for the garment or in an advertisement. Rita Dubas writes how Temple would pose for more than 20 product shots every few days. A rather taxing assignment for any young child. The first dress from our collection is a light blue silk crepe de chine Shirley Temple brand pleated and Battenberg lace yoke dress. It belonged to Carol Logue, who was born in New Brunswick, NJ in 1936. It was produced under the Nannette Company for toddlers. The second dress is a peach-colored rayon sleeveless dress with pleated ruffle collar, pleated straight skirt, and black velvet bow and waist tie. It is a Cinderella Frock and was worn by Harriet Green to her grandparents golden wedding anniversary in 1936. Harriet was six years old at the time. The last dress is a multi-colored flower girl’s smock; knee-length; short cap-sleeves; squared collar with lace trim; bodice has two darts and a belt-loop on each side; white trim along the bottom hem; four small white buttons down the back. 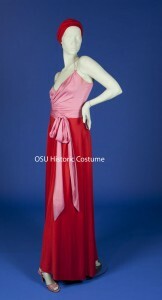 It was purchased at auction by the Collection in central Ohio. Wear red for Valentine’s Day and American Heart Health month! Valentine’s day is in February, which is also American Heart Health month celebrated by The Heart Truth® and Go Red for Women®. The Heart Truth® created and introduced the Red Dress℠ as the national symbol for women and heart disease awareness in 2002 to deliver an urgent wake-up call to American women. The Red Dress® reminds and inspires women to take action to protect their heart health. Each February since its launch, the Red Dress symbol has come to life on the runway with the support of the fashion industry and celebrity models at The Heart Truth Red Dress Collection Fashion Show. So, we are posting a couple of our designer red dresses here in solidarity. A couple more can be found on our Facebook page. Wear Red!